By Ted B. Lyon and Will N. Graves, with contributions by others. 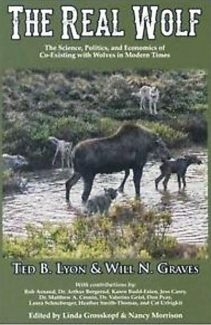 In The Real Wolf, authors Ted B. Lyon and Will N. Graves along with their host of contributors show how institutionalized misconceptions about the wolf in North America led to the growing wolf problem in America today. After the near-extinction of the buffalo, once the primary source of food for the plains wolf, and the introduction of domestic livestock, the wolf itself was hunted to near-extinction in North America itself. A stable population of wolves lived in far northern Minnesota, despite being vigorously hunted whenever they ventured too far out of an accepted territory, and the authors contend, a small population of wolves survived in the Rocky Mountains around Yellowstone, which is an important point. Very simply, after the wolf was cleared from most of the United States, and the remaining wolves, responding to pressure, became reclusive, North American biologists came to the conclusion that the wolf was harmless to humans. A campaign began in the U.S. in the 1960s to improve the image of the wolf, and by 1974 the wolf was listed as an endangered species under the Endangered Species Act. Immediately, the population of wolves in Minnesota began to grow. In 1992, the U. S. Fish and Wildlife Service released a total of 66 Canadian wolves into the Yellowstone National Park. The predicted effects of this decision, whether intentional or not, have proven to be false. The population of elk in Yellowstone National Park has gone from a high of 20,000 animals in 1992 to some 3,200 today, and the moose population has gone from a high of 1,200 in 1992 to almost none today. The impacts of wolves on these populations were predicted to be much less, and the result of this decrease has led to decreased hunting revenues for the states involved. Additionally the authors point out that there was in fact a small population of native wolves in the area; the introduction of a different subspecies in the region will virtually eliminate the native subspecies of wolf due to crossbreeding. As the prey in Yellowstone National Park dwindled, the wolves moved to private property and began killing livestock, creating a huge financial burden on ranchers and farmers in the area. Besides the loss of revenue from actual kills, and the authors give evidence that for every confirmed wolf-kill of livestock there are probably seven unconfirmed kills, the constant threat of predation leads to lower conception rates, higher abortion rates, and lower weights. Despite the spectacular success of the reintroduction from the wolf standpoint, efforts to de-list the wolf from the Endangered Species Act and begin active management were opposed in the courts by Defenders of Wildlife, The Sierra Club and others. The authors of The Real Wolf contend that in addition to emotional attachment by some groups, the cause of the wolf has become a financial windfall for certain groups. For the past several decades, the mantra among pro-wolf groups has been "there are no confirmed cases of healthy wolves killing people in North America." While that may or may not have been true before, there have now been at least two confirmed cases of wolves killing humans in Canada. Without being too sensational, the authors of the The Real Wolf want the reader to understand that wolves are highly efficient, and perhaps most importantly, very intelligent predators. The fact that few North American wolves have historically attacked people is the result of environment and not due to inherent behavioral differences between North American wolves and wolves in other countries. As the supply of other prey runs out, and as wolves become increasingly crossbred and habituated, some wolves will explore humans as prey, especially if they learn that humans can't or won't fight back. These are just a few of the topics covered in The Real Wolf. Because it was written by several people of different styles and abilities, it reads more like an encyclopedia than a book, and there is duplication of themes and even statistics here and there. In most places it is easy enough to understand, although a chapter discussing taxonomic classification of wolves required slower going. I found the "Editors Statement of the Issues" and "Editors Statement of Facts" at the beginning of each chapter to be unnecessary and somewhat annoying, but that is a small complaint. 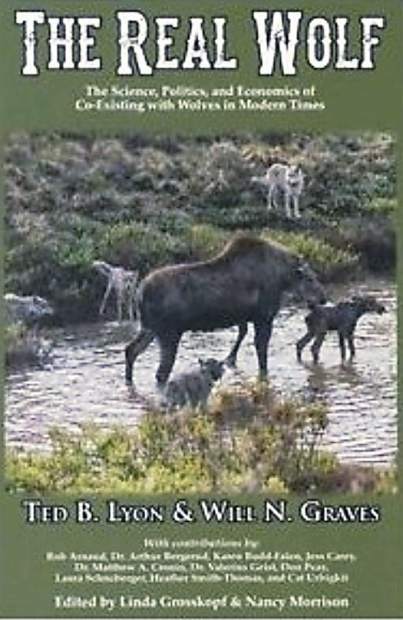 I would recommend this book to anyone wishing to inform their opinion on the wolf population in the United States. The Real Wolf is available both in print or digital download from Amazon and Barnes & Noble, or can be ordered in print at http://www.farcountrypress.com.